Using a hanging canvas organizer, organize your child's outfits for the week...one outfit per slot. Doing this alleviates a lot of conflict in our home--the kind that begins with, "but I don't want to wear that today". 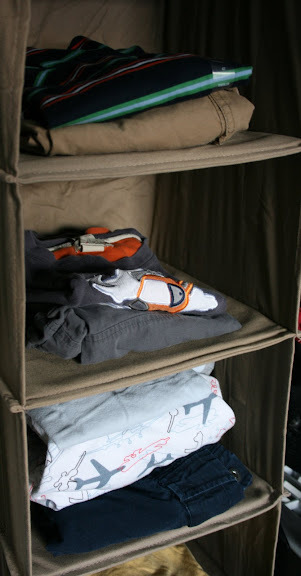 Instead, I sort my children's outfits in a canvas sweater organizer (trying to include that favorite spider shirt each week!). Depending on the age of the child I may include underwear & socks. I then choose different outfits to meet their different needs (park outfits, school outfits, church outfits, etc.) and place them in a slot. In the morning when it's time to get ready, the child goes to their organizer and choose one of the pre-approved outfits. 2. Mom doesn't have to worry they'll choose something inappropriate to wear and arguing over ensembles becomes virtually obsolete. 3. Depending on their mood that day, the child will have enough choices to find something that works for him/her. I realize there may come a time when this doesn't work anymore. But, if your kids are between the ages of 2 and 10, I think this plan is feasible. For more easy organization tips, click here. Hey! I do the same thing, and I LOVE it! You always have such great organization tips--gracias. I use this same method! As long as I'm on top of the laundry, it works wonders. I love all your tips, you wonderwoman, you! I so agree, lettiing them have a say into what they wear when you do the planning saves many whining and cryign mornings! I havent quite done it by the week but definitely do it the night before. This is PERFECT for my 6 year old who has recently started the, "But I don't WANT to wear that today." Life will be much simpler.... Thank you! You are seriously brilliant! Thanks so much for posting this. By the way, I have a few in-home conundrums I'd love to get your advice on and may make great topics for blog posts. Can I email my questions? Maybe you could start a, "Ask Steph" column, ha ha. We started using this closet idea when my daughter was in preschool. It was suggested by a friend when I mentioned how much trouble we had agreeing on something to wear every day. Every Sunday night she'd pick out her outfits for the week & we'd put them in the bins. Once they were in there, however, there was no changing her mind on the outfit or there would be consequences... losing out on tv time, etc. It was amazing how much easier it made things in the morning. great idea! My 4 year old has lots of opinions on what to wear. This method would definitely help. Feeling independent is important to anyone. Of course it applies children as well. Your system sounds great. I just wonder as a person without kids (so far) what do you think is an inappropriate outfit for a child if not talking about too short shirts or trousers when it's cold or vice versa? Do you mean too fancy clothes (reserved for celebration for example) on a park day or something else? I'm just curious since I don't have much experience on this field. And at what age do you think kids can choose their own outfits? And also, I think this idea is not only good for the mom, but for the dad, too! I expect a couple to be equal in household and think it's not always mom taking care of the kids. I completely respect your choice and way of doing things but want to remind that there are many fathers who enjoy duties of parenthood as well. I know some single fathers for example who get upset when people question their parenthood or quality of care for their child and emphasising only the woman as the "right", "good" or "only" parent in a published text just emphasises this negative attitude towards equality even without meaning to do so. I'm sure that you don't mean to exclude fathers in your text by a choice. I totally do this for my kids! It has worked great for my son. My daughter usually ends up choosing something entirely different, I guess she likes to change her mind!